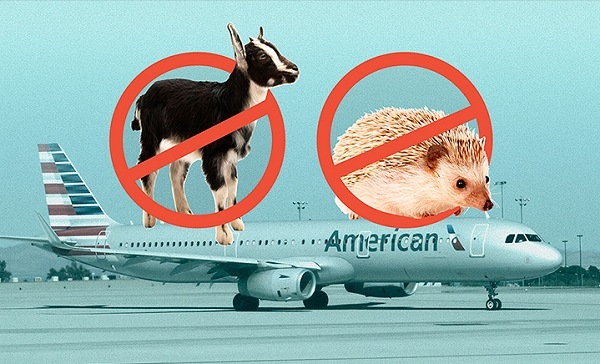 Forget about bringing your goat on an American Airlines flight for emotional support. The world’s largest carrier announced Monday that it was joining several other airlines in adopting new restrictions for passengers who bring animals into the cabin of a plane. The use of such animals on flights has ballooned in recent years. American Airlines (AAL) said that between 2016 and 2017, the number of customers transporting service or support animals aboard their planes rose by more than 40%. In the last few months, several major carriers have reported a surge in animals brought into commercial airline cabins, resulting in animals urinating, defecating, biting, barking and lunging at other passengers on planes. Now, the airline is cracking down. The airline’s revised rules go into effect on July 1. For a complete list of the new rules, click here. Delta (DAL) and United (UAL) both issued guidelines tightening the rules on emotional support animals earlier this year.